The New Year is a time to start fresh. It’s about setting goals or resolutions and making small tweaks in our daily lives to improve overall wellness. Although the holiday lights have begun to disappear, only to be replaced with the normal façade of the home, the smart grid continues to shine amidst all of the changes. From energy savings to making renewable energy feasible, the smart grid continues to offer multiple benefits and gifts for energy consumers. The beauty of the smart grid is that it is constantly improving by adapting to consumer needs throughout the year not just at the beginning. Studies have shown that installing a digital meter can not only grant you more control over your energy consumption, but it can also increase your energy bill savings annually. The $600 in savings could assist with those New Year resolutions posted to the home refrigerator. Gym memberships and travelling more this year can become feasible. Healthy Living: Over time, having a healthy year has graced the pages of many New Year’s resolutions. There are multiple ways to get healthy for the New Year, including taking a step back from the refrigerator. Decreasing the intake of junk foods is an easy way to kick-start a healthy lifestyle. The smart grid can also have an impact on energy savings with your refrigerator. The energy savings over just one year alone from smart grid technologies could power your fridge for 199 million years. That could last through multiple Ice Ages. Recycle, Reduce and Reuse: With society finding ways to ensure that the world is a safe place to live for millions of years to come, the idea of smart living and renewable energy has become the talk of the town. One way to live smarter is by recycling everyday items such as cans and bottles. Every time items are recycled rather than thrown into landfills, the amount of carbon dioxide emitted into the environment is drastically reduced. Another way to reduce carbon dioxide emissions is through the implementation of renewable energy mechanisms such as solar panels. Solar panels, when used in conjunction with smart grid technologies, can become feasible energy alternatives. Within 5 years the energy smart grid can save with renewables will allow 1.2 million households to be powered by clean energy. Take a Trip: Plan to take a trip to somewhere different and unique this year. Paris maybe? With the yearly $600 savings smart grid can bring, plan a trip to explore the world. The energy savings the smart grid can offers can also buy 7.6 million round-trip flights from JFK Airport to Paris, France. So pick a place and just do it! Give your resolutions an extra push today. 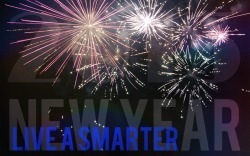 Make no excuses this New Year with the smart grid. To learn more about smart grid gifts and the 9 percent savings, check them out.